For the last few days I've been trying to sit down and post this blouse but the spring weather has been calling me elsewhere. How about you? It feels so good to get outside and at this time of year there are a million chores in my garden. While not the case it seems like most of my time is spent getting the irrigation system started after the winter hiatus. Totally necessary and water-wise here in California. Plus it will be 100℉ soon and that's the time to stay in the shade and sew! Or take a sewing class - updates for all my upcoming classes are detailed at the bottom of this post. 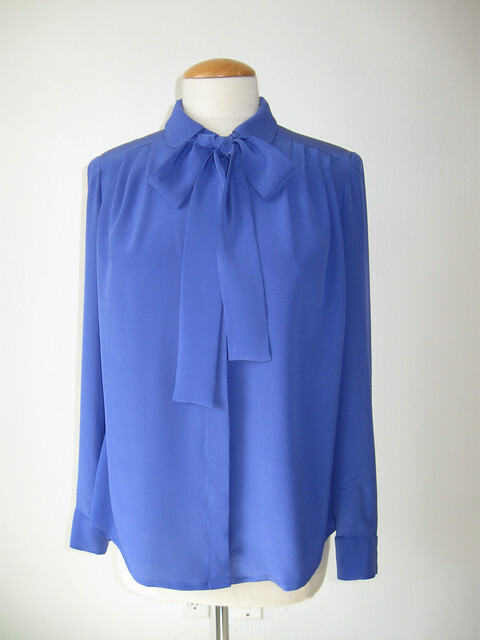 As for sewing this blouse - I finished it in early December. And it has been waiting for the accompanying jacket to be completed, and then some opportunity to take nice pictures. Which are done, thanks again to my friend Alice. Although strangely we only took one or two with the jacket off. Oops. But the light was just right and this is a very good representation of the color of this silk. Which I bought at Mood Fabrics back in 2016 during my trip to NY. 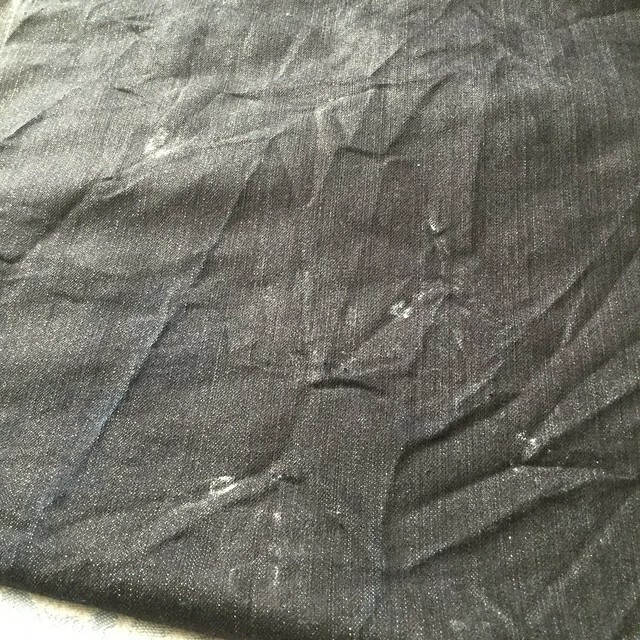 I bought this silk and another one, closer to a navy blue, and then the double sided wool fabric that I used to make the jacket tossed over my shoulder. Next post on that jacket. To confess, I'm not totally sure about my pattern choice here. I made this same pattern a while ago, in a plaid cotton. I think I like it better in the cotton. The reason I chose it for this fabric is the nice hidden buttonhole placket (which I could have done on any pattern but on this one it is included) and then the lack of shaping. 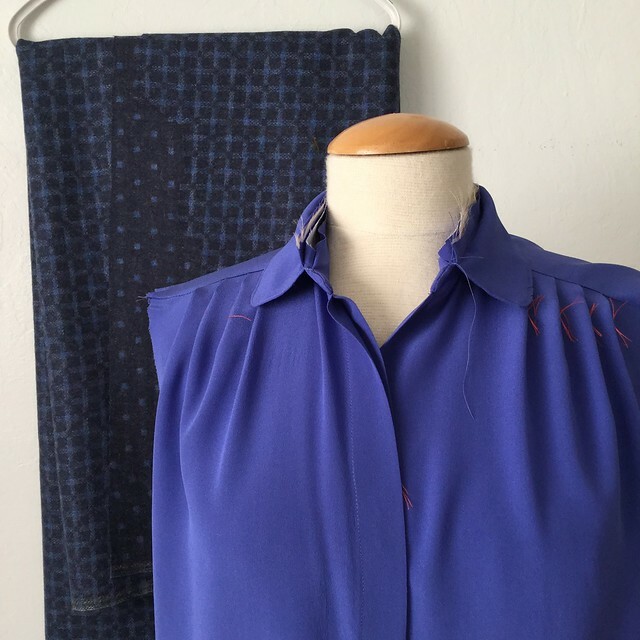 Sometimes I find that silk crepe de chine gets kind of wrinkly if it is a shaped shirt, and a more loose silhouette works better with the fabric. But I think I overdid it on this. Not that I dislike it - but would make some other choices if I could do it again. I like the bow look on the pattern but didn't want to be limited to that, so I made a detachable bow. And used just about every square inch of the fabric. Virtually no scraps left, which is nice for a change. 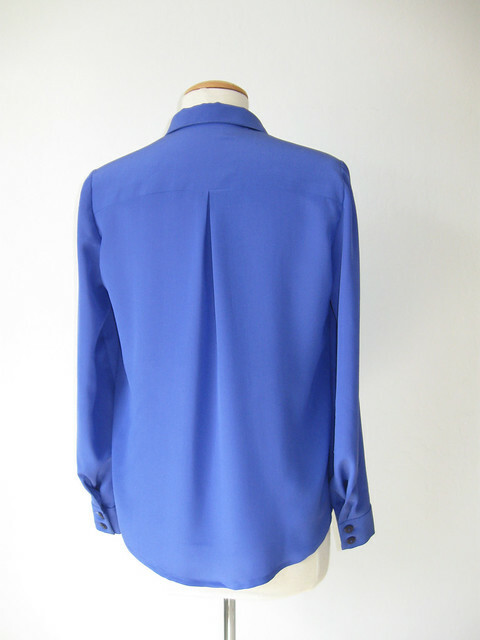 Sewing details - this blouse has no darts but instead pleats at the shoulder yoke. which means a lot of tailor's tacks. After I finished the blouse I stitched down along the shirt front edge of the buttonhole placket as I didn't like the way it gaped open at the top. Since I didn't put a button there near the top it wasn't needed in that section. I think that may be way I prefer the other method which is detailed in my Craftsy post linked to above. By the way that's the jacket fabric hanging behind the partially finished blouse. 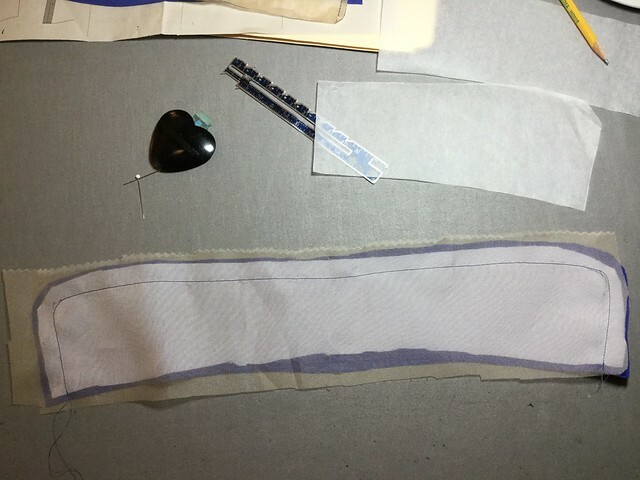 A bit about interfacing - sewing with silk like this requires a bit of thought and testing when it comes to choosing the interfacing. I always make some samples with various weights of interfacings. In this case I used the Fashion Sewing Supply Sheer Elegance Light in the buttonhole placket and also in the collar and cuffs. However if you look closely at the unfinished collar there is another fabric in there. The collar seemed a bit floppy so I added a layer of silk organza interfacing. Not sure why I took this picture. Maybe to show that I had sewn the collar and then decided to add, so I roughly cut out a piece of silk organza, stitched it onto the collar and then trimmed it later. For the collar stand I think I just went with the two different types of fusible interfacing. The collar stand at the bottom of the picture has a very lightweight Japanese interfacing that I buy at Stone Mountain, here's the link to the page on their website. They show 4 colors (black, white, and 2 shades of beige). This interfacing is the best I have found for certain applications on silk or other lightweight fabrics. The beige tones seem to magically disappear on sheer fabrics or at least don't show so while expensive they are worthwhile and of course you just use a small amount on each project so 1 yard will last you a good while. Thinking about RTW silk blouses I have had, they often have the edge stitching which keeps them crisp so I actually hunted around in my desk drawer to find the edge stitching foot. My sewing machine came with a lot of accessory feet - and I rarely use any of them. Zipper foot, yes all the time. Walking foot - Never! I just saw someone on IG this morning praising the walking foot and I understand the appeal - but I don't think I have ever needed it? Anyway the edge stitching foot did work well for this collar. Sewing on buttons - my least favorite sewing task. And I am super picky about them, so I sew one at a time and then button and make sure they are placed correctly and not pulling the front up or down. Perhaps my little obsession makes me also hate this task. But I tell myself extra time will result in satisfaction and not annoyance at misplaced buttons. On a shirt there is a bit of wiggle room on the button placement - on a coat there is no wiggle room - they must be in the exact right spot or I will not rest. As evidenced when I made this Quart coat from Pauline Alice patterns - and tangled with the button placement until it was just right. Plus plaid and double breasted style - buttons are critical. For the length I knew I would be wearing this with a shorter jacket so decided to make it kind of long, and I'm not entirely sure this is successful on me. You'll have to see when I show it with the jacket on. Which will be my next post! Here's a quick look. So up next, a post on the jacket, another silk top which is more summery, a few sleeveless dress and some tropical travel in the near future :) Which meant some unnecessary but always fun sewing. And Me-Made-May just around the corner. Maker Fair Bay Area is coming up in May, and to participate in that we have a class at Hello Stitch Studio on Thursday May 17 which is a bit of a bonus - with a social component. Or should I say Sewcial? I did this class a few weeks ago and I think it's a great way to get familiar with adjusting your paper patterns - no pressure as we go through adjustments on sample paper pattern pieces. 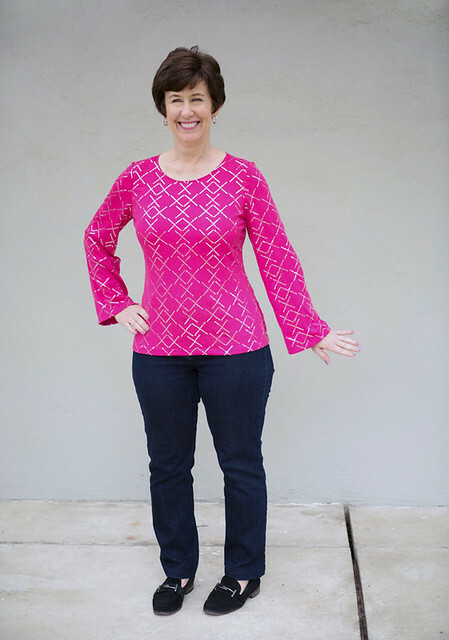 Plus the why and how behind them, how to measure yourself and how to choose a pattern size to start with. The Sewing Clothes Support Group is a great way to use the studio - all those lovely machines and cutting spaces. Bondi Dress: Sat. June 2 - this is a great summer dress, and we have every size at the studio so you can come in, try on to figure out your best size and then start sewing right away. Plus the patterns on oaktag for easy tracing, also the pattern which super cute and versatile is included in the cost of the class. (you will receive the pdf pattern and instructions but don't need to print out as those are at the studio). 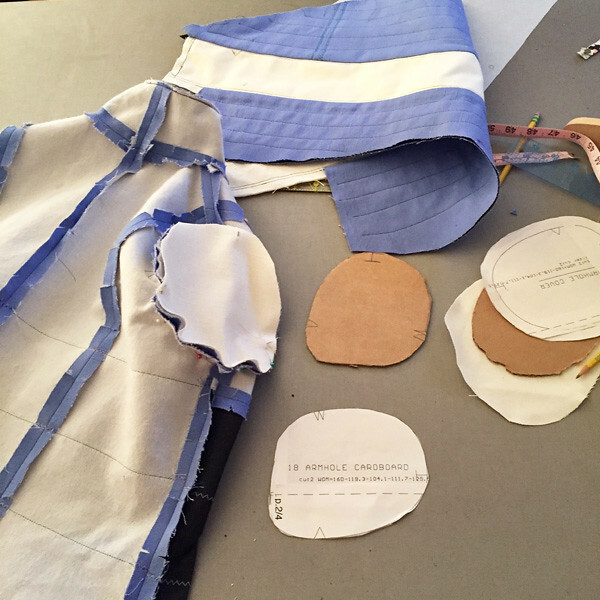 Pattern alteration and Tissue Fitting: Sun. June 3. A slight change on our Fit Lab class. 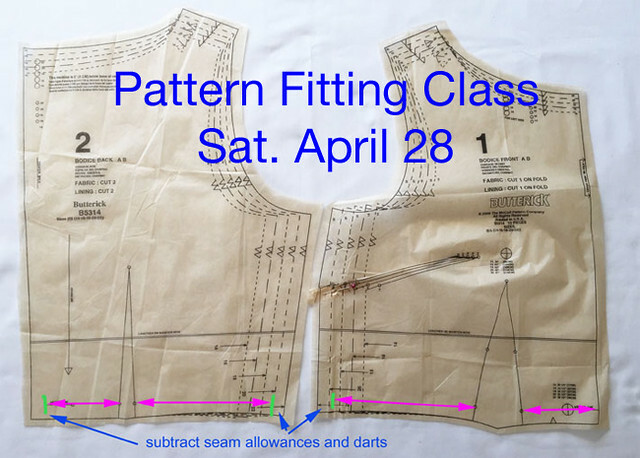 This will be common pattern adjustments, similar to the Adjust the Bust class with paper samples to practice on, also how to measure and choose pattern size, and then an optional part 2 of the class where I will help you tissue fit and adjust a specific pattern. Pencil Skirt: Sat. June 16. Sew a fitted pencil skirt and perfect your sewing on darts, waistbands, zippers and the walking vent. All the classes are listed on the Hello Stitch website, under Garment Sewing. 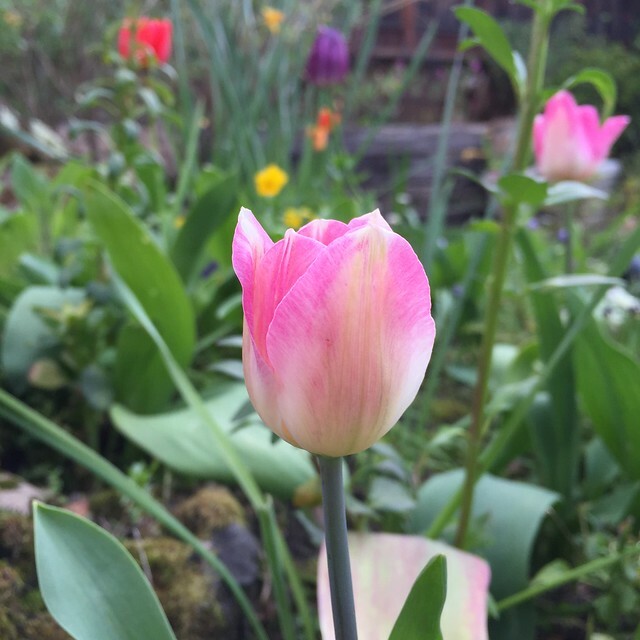 Today's garden photo, the tulips are all gone now but a few were spectacular while they bloomed. Do you find the number of new sewing patterns released a bit overwhelming? Looking at blogs, instagram, various newsletters and other sources means that I find something new almost every day that I want to make. I think choosing patterns that are good for you is a skill you can learn. Unfortunately it comes with a bit of expense, both in time and money since you can't magically determine if a particular pattern will work for you. The investment in your time and in fabric is a real thing. Some aspects of that are just experience, like anything else, and learning from your mistakes. 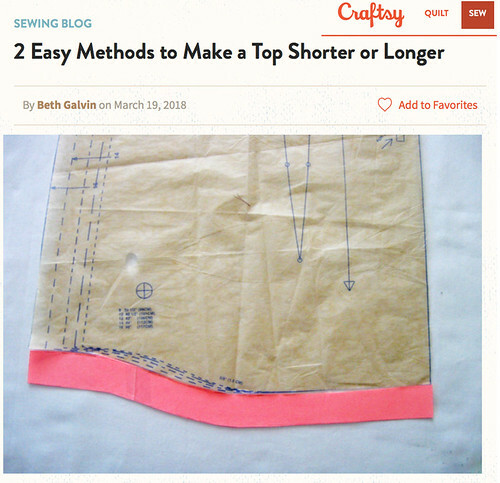 Hoping to help people skip a bit of the trial and error aspect of pattern selection I have a class at Hello Stitch this weekend (Sunday April 22, 10 am - 1 pm) that can help with this aspect of sewing knowledge. www.hellostitchstudio.com to register for any classes. By the way - if you want to make it a full day there is a knit t-shirt class at 2pm the same day. This is currently my favorite class to teach! 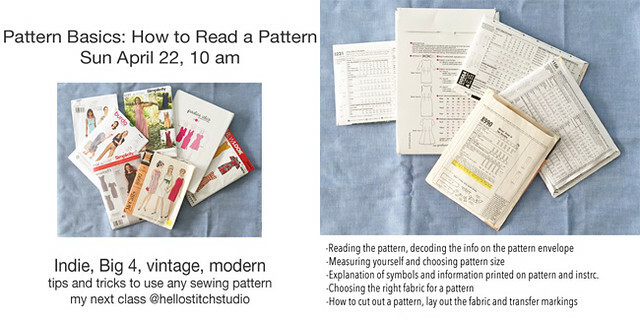 It's really rewarding to help stitchers of all levels understand all that info printed inside and out (or digitally) on a pattern and how you can use that information to make your sewing more successful. 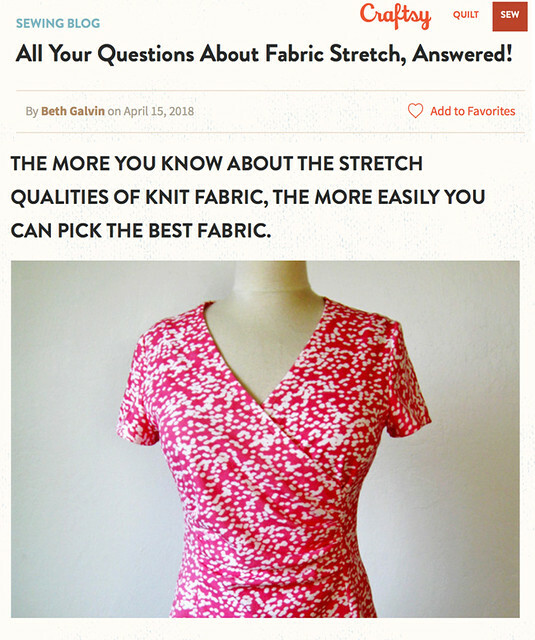 Including things like "why are the specific fabrics recommended?" "what does loose-fitting or semi-fitted mean" and my favorite "why does this pattern take 4 yards of fabric?" So if you use any kind of pattern: PDF, envelope, vintage, modern, multi-size, cup-size, we talk about them all and also cover pattern markings, measuring yourself, and choosing the right size to start with. My other class this month is a Pattern Fitting class, Sat. April 28 at 10am. This is actually a two part class. 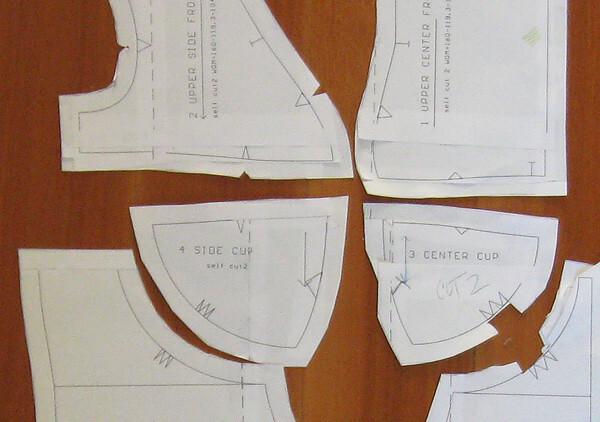 In the morning I will go over a lot of common fit adjustments and show how to do them on the pattern pieces. The second part is a Fit Lab where I will help you tissue fit your pattern and do the adjustments to your pattern pieces. 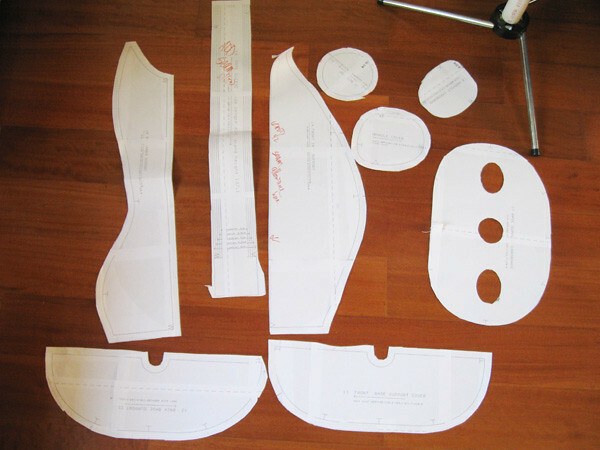 You can sign up for just the Pattern Fitting overview or both parts. And in June we are doing the Bondi dress class again, this is a great summer dress and the best part is that the pattern is included in the cost of your class. We have a dress sewn up in each size so you can come into the studio to try on the dresses and see exactly which size is right for you, then trace off your pattern size from the tagboard versions we have at the studio. It's a simple pattern so that is a quick process, plus you get the PDF and the instructions mailed off to you. Here is a terrible blurry photo of all the Bondi dresses hanging up in the studio. My last class was full and I planned to take some photos but never slowed down to do that. Latest Craftsy posts: here are my latest on the Craftsy Sewing Blog. A post about knit fabrics. Although I want to issue a caveat on this one - I wish the sewing world would have a definitive wording about knit fabrics. Note that in this post I refer to 2-way and 4-way stretch - but sometimes it is referred to as 1-way and 2-way. Which if you look at the diagrams in the post then it makes sense but how should we refer? 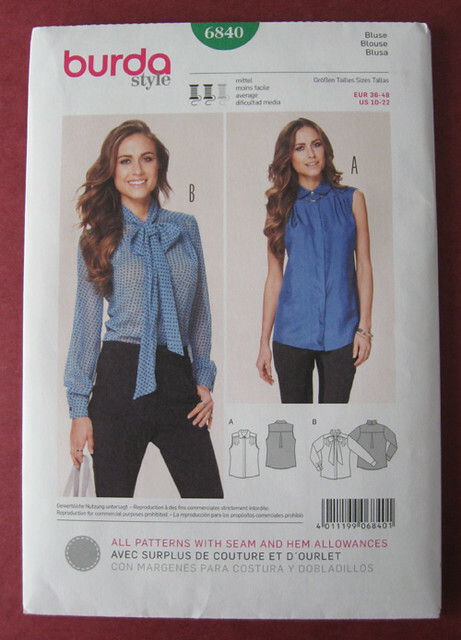 On most of the patterns I looked at I noticed that they called for 2-way stretch knits. By which they mean knits that stretch both on the cross grain and the lengthwise grain. Aargh - what should I have called them? 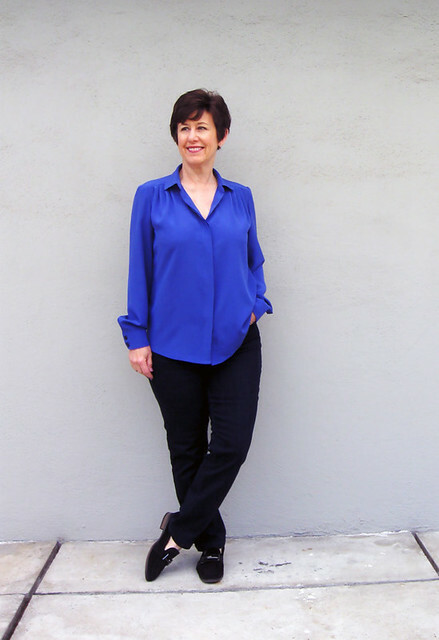 Another recent post is this one on how to lengthen or shorten a top. Which seems like a simple adjustment but there are a few things to note. In fact my friend Meg just did a recent post on the same topic, with some really good diagrams as well. What I've been sewing: I just finished this dress and have a few things I would change if I were to make it again, which I don't really plan to. 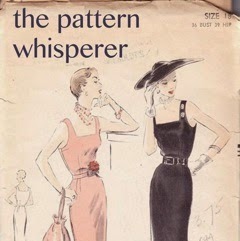 As there are so many knit dress patterns I would like to try. But our scorching hot weather is not that far away so I'm sure it will get plenty of wear soon. And the fabric colors are so pretty. (Stone Mountain bargain upstairs purchase). Up next: some tropical travel is on my calendar so you know what that means, frivolous floral sundresses - my favorite thing! today's garden photo - the first backyard rose. This might be the oldest rosebush in the garden but oh that color - so pretty. 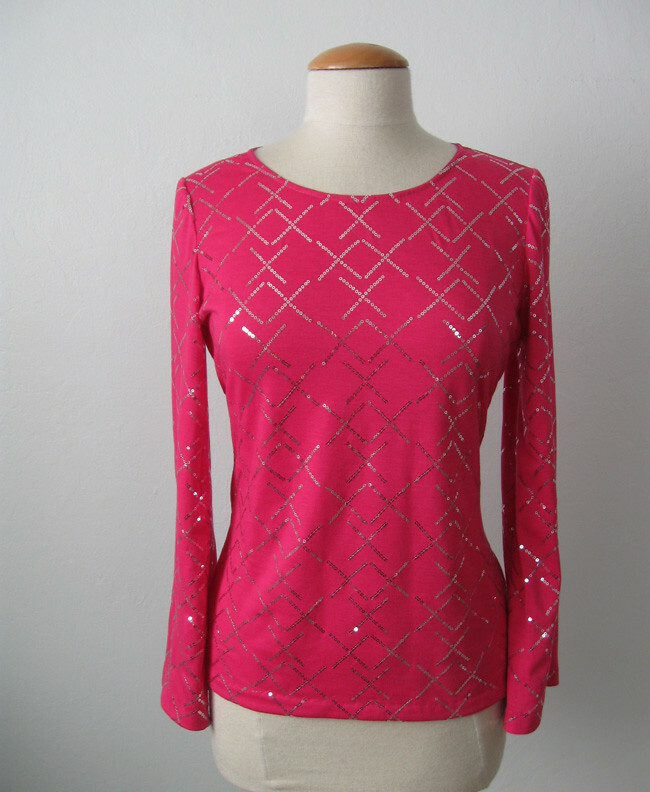 For the longest time I have wanted to sew a sequined knit t-shirt. I actually have one in my wardrobe that I bought ages ago at Loft, it's a burgundy color and I wear it often. It's just the thing when you want to be casual but a little sparkly. That one has burgundy sequins (same color as the t-shirt) in rows so it's a bit subdued, if a sequined item can be considered subdued. While I really wanted a blue or turquoise fabric, when the fabric fairy leads you something on your search list you just have to give it a try. I ordered this from Fashion Fabrics Online, along with a few other items, 2 jersey knits and a lightweight silk crepe de chine. And everything was a winner. That site can be hit or miss, for the most part I've had really good luck but choose carefully and generally order when things are on sale so the investment is not too bad in case they are not to my liking. I think this sequin cotton knit was about $5 per yard so I ordered 2 yards and got a very generous piece. In fact I have enough left to make a sleeveless summer version:). As mentioned above I was searching for the tone-on-tone sequin look but hadn't seen anything like that so I figured why not, even though this one with the silver sequins was a bit more sparkly that I was thinking of. After I sewed it up I asked on Instagram whether it was cute or geriatric, and got plenty of comments that were pro-sparkle. As most people said, why not? Sewing details - this one had me puzzling how to sew it up into a knit t-shirt. 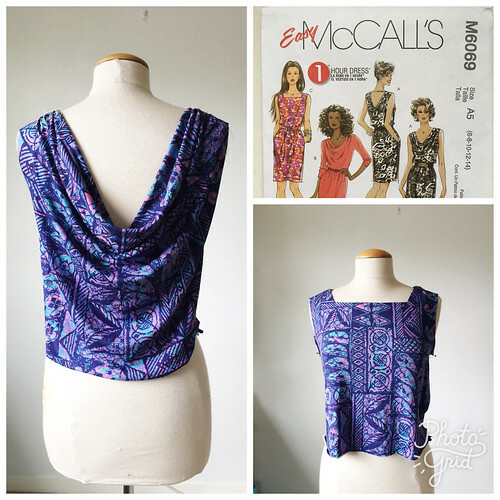 As often happens inspiration came from an existing item in my wardrobe, McCalls 7538. This knit is only a one-way stretch, so it stretches crossway only, not lengthwise. Which is workable for a t-shirt but I needed some way to finish the neckline. 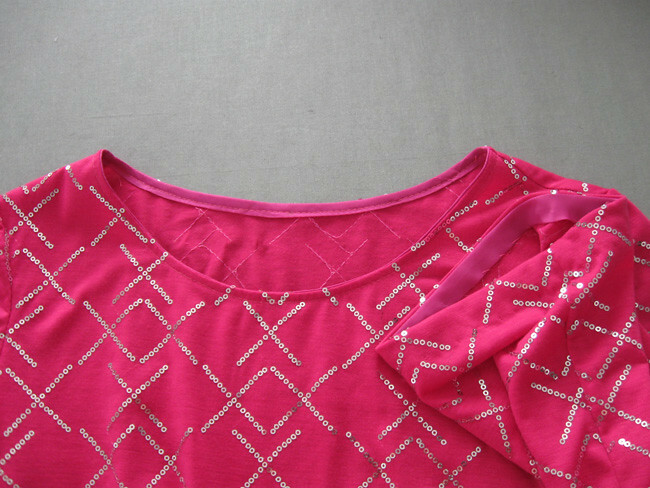 The sequins were stitched with regular straight stitch so made it not possible to use the fabric as a sewn on band. 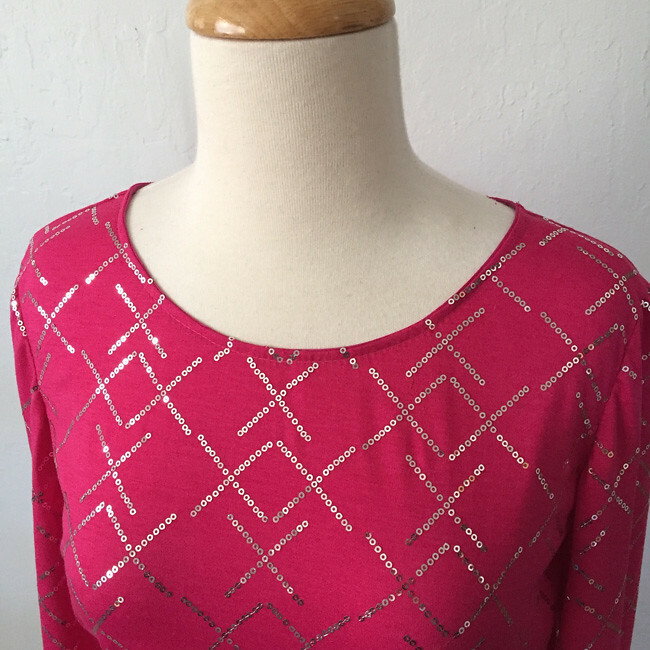 Plus it would be super scratchy to have the sequins on the neckband. 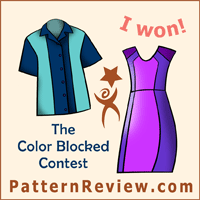 I used this pattern as the starting point, as it had a turn and stitch neckline. Which I scoffed at when I made the first version but now it seemed like a good option. And as usual I didn't make any of the various variations on the pattern envelope, but used the round neckline and the t-shirt length. Here's the link to my first version in a stripe. 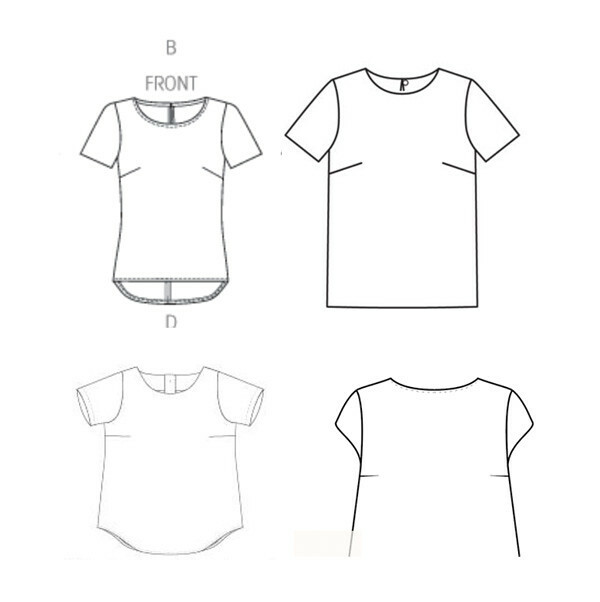 In order to make use the neckline and sleeves but omit the diagonal seaming and piecing I placed the pattern pieces together, pinned them along the stitching lines and then just traced a solid t-shirt front and back. Jumping ahead here is how I finished the neck, by using bemberg rayon lining as bias binding. It was in the scrap box and a good enough color match. Originally I planned to make full sleeves with elastic at the bottom but it somehow seemed better just to make a bell sleeve. Way easier too! Same binding on the sleeves although I did sew that as more of a hem facing and hand stitched it on the inside. 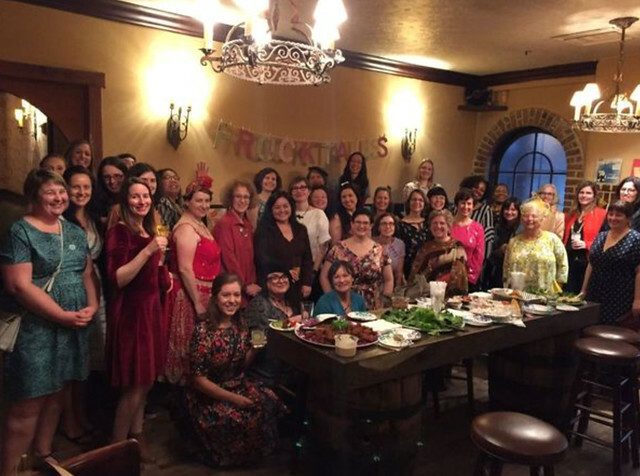 So far I have worn this top exactly once - to our Bay Area Sewists Frocktails event back in February. 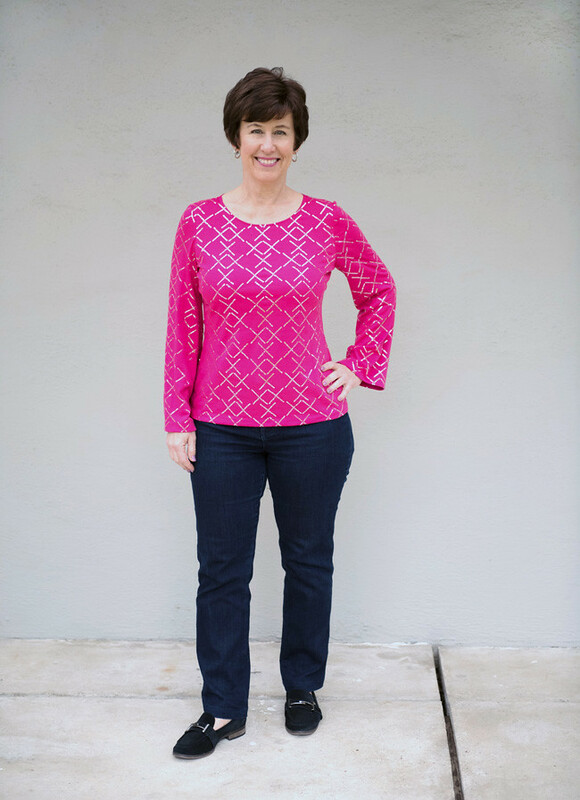 It was after a long day of teaching sewing classes at Hello Stitch Studio, so a sparkly t-shirt and black skinny jeans was about as dressed up as I could muster. But I think next winter and holiday season I will get the opportunity to wear it a lot. Although it's one of those memorable things - do you wonder if people say to themselves - "oh there she is wearing that outfit again". Which is kind of silly as clothes are made to be worn and if certain ones make you feel good you should wear them often. It was a fun event, Chuleenan of CSews blog is the organizer and she does a fantastic job with finding locations and organizing everyone. Goofy pose to show off the sleeve shape. So that's the latest on sparkly sequin tops - until I make the summer version. 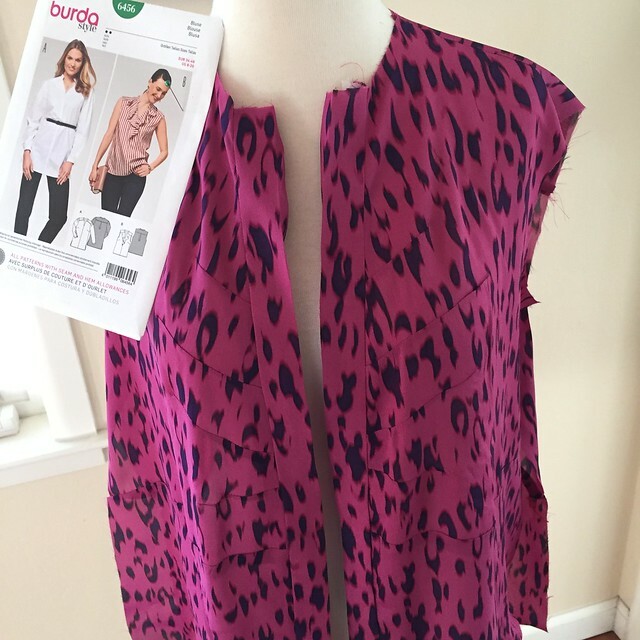 Up next more pink - just about finished with the printed silk top that I showed in my last post, the course correction from that Burda magazine shirt to the Burda envelope pattern has worked out well and I love the result. And a pink/purple knit dress also in the works. I have too many projects going right now, so this weekend's vow is to complete everything in progress before I can start anything new. We shall see if I stick to it. This afternoon was the plant sale at the local junior college horticultural dept. I have had the best luck with plants bought there - they propagate so many California natives and plants that are perfect for our climate and dry summer. 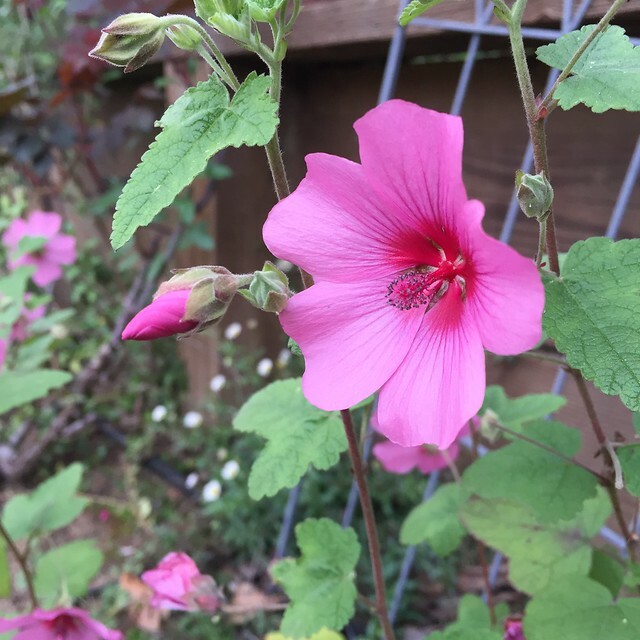 So with our pink theme today, this is a pink mallow (lavatory) that I bought a year ago, left in the pot all that time, finally planted in the late fall and it is looking so good! Lately I'm searching for tall plants and this one is just that. Or will be soon enough. It seems like I have been trying to write this Random Threads post for about 2 weeks, but never quite had the time. 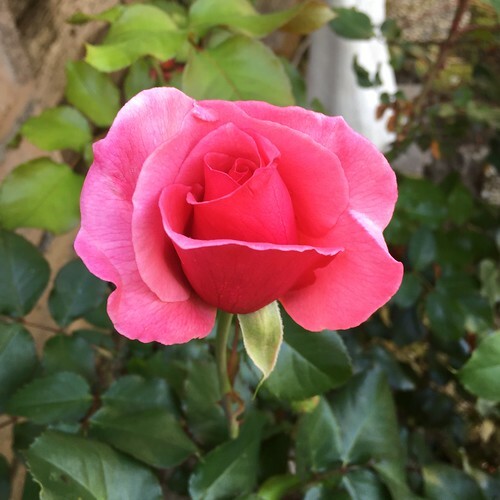 We are having a glorious weather week now in the Bay Area and I just came in from planting a bunch of annuals, some weed pulling and some attempts to get the climbing roses to trail where I want them to. Sitting in front of my laptop seems like a relaxation by comparison. It also seems like I've been sewing nonstop for weeks, so it's good to take a break and get outside for some yard work. The nonstop sewing included finishing a couple of things that were winter items - and I might get a couple of wearings before the it is just too warm. I've been making a few versions of a dress from Tessuti patterns, their Bondi dress. We are doing a class at Hello Stitch in April to sew this dress, and the pattern is included in the class. We also will have one of each size sewn up so you can come into the studio and try on to find your perfect size. More on my other classes below but let's get to Random Threads! New Pattern Releases: every time there is a new pattern release I tend to think "hmm...not at all interesting" and then a few weeks/months/years later I buy the patterns. Do you jump on the new patterns or let them marinate a while? Even the new Burda magazines, I'm just now finding things I would like to make from the Dec. and Jan. issues and the spring issues are kind of bland. Which means in about 3 months I will find all kinds of stuff to sew in them :) Late breaking edit: I just looked at the Burda May issue preview and line drawings and meh, nothing interesting. Just saw the new Vogue Summer release, and again, not so much. With the exception of Vogue 1584 Tracy Reese knit dress which is all kinds of interesting and I hope to get to that this summer. How do you Pin? Now that I have lots of students I am fascinated to see how people pin when they are sewing. 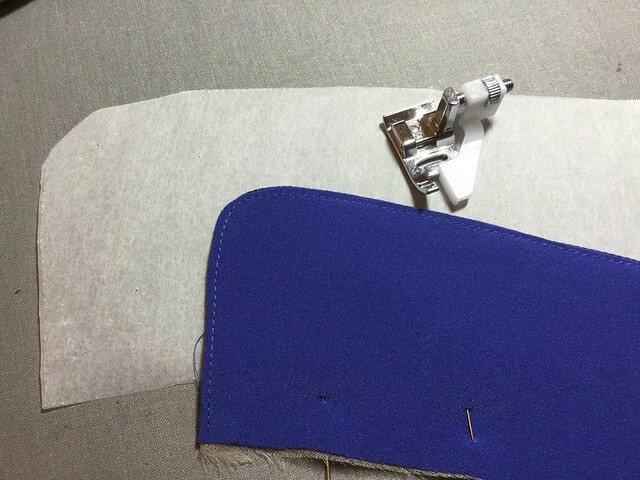 Generally I can only do it one way, it's not necessarily right or wrong, but based on the fact that I am right-handed, and it seems the sewing machine is set up to favor a particular way. I put the heads of the pins on the edge of the fabric, as this makes it easier to remove them with my right hand and also easier to pin them in. But so many people put them in with the heads of the pins towards the garment. Do you do it a specific way, or have you even thought about it. Note that the photo above is exaggerated - I am always trying to get students to use fewer pins. 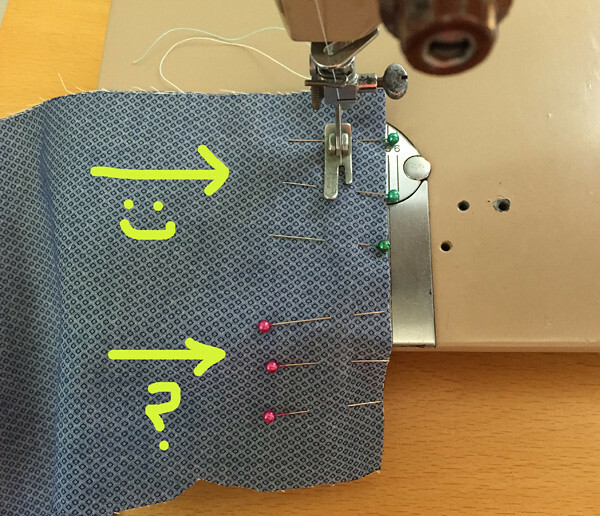 I think newish garment sewers tend to put too many pins which is cumbersome and probably not needed but it does take some practice to use few or no pins. Direction and angle of darts: Oh this is my obsession of the week. Bust darts that are completely horizontal just drive me crazy. I think they look so odd. But perhaps this is a question of personal preference and it is not something anyone else notices. We all have our own little obsessions, things that just bug, yours could be collar shape, or pocket placement, and mine is dart position. To me the bust darts that are completely horizontal look cartoony. 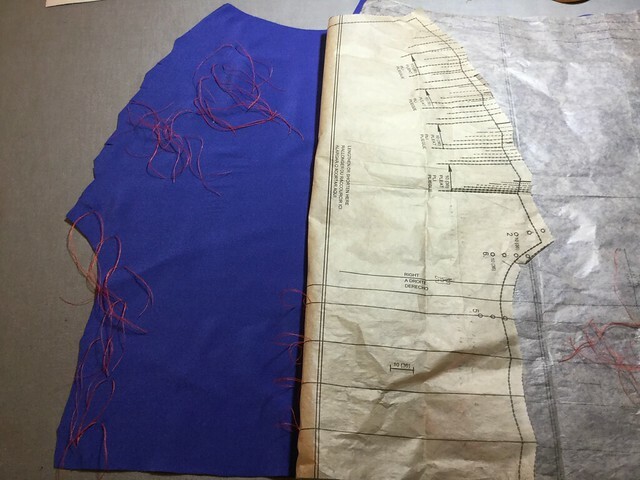 I didn't want to include finished garments as I haven't sewn anything that I could recall with this feature, but here are a few line drawings to illustrate this. Have you noticed this? What is your irrational annoyance in pattern design? Changing your mind mid-project: I'm in the middle of making a shirt from a recent Burda magazine and about half way through decided that the fabric was all wrong for the style. Or not really so bad but it would be better as something else. Plus our weather is heading towards hot so what was I thinking making a long sleeve shirt? 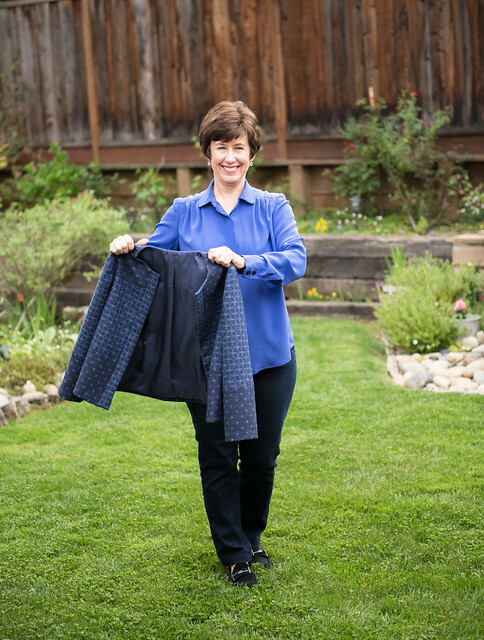 I had been making this shirt from the April issue (see, trying to make something right away does not work out for me :) It's a cute shirt and I will revisit it in the fall. Meanwhile I just bought this envelope pattern, which I'm sure I saw in a magazine in the last year or two. Anyway I had not cut out the sleeves for the shirt, sometimes I do that when sewing, just cut out the pieces that I need to start and wait on the other details like sleeves. Consequently I will use the back as is and then I can eke out the front and ruffle from my remaining fabric. This silk almost-chiffon is more suited to a ruffle top than a darted one. My new favorite blog: Sea of Teal. 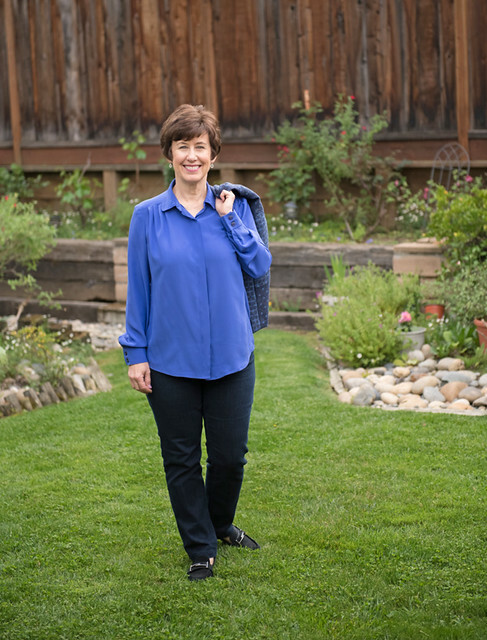 Here's a link to a great outfit post. There is something about her style that I find really appealing. And I'm always glad to find a new to me blog with someone making coats or jackets in addition to all the other wardrobe components. Dark fabrics in the laundry: Are HE (high efficiency) washing machines actually lower in efficiency? I ask because mine is causing all kinds of frustration when I follow all the guidelines and wash dark fabrics, particularly denim. Custom Dressforms: So often people ask me about sewing and ask the usual questions such as "do you have a super fancy sewing machine" my answer is no (pretty much the opposite.) Do you have to use a dress form? Again my answer is no. It's nice to have but something I sewed for myself without for most of my life. I do have a couple of form now, one adjustable one was a Christmas gift, a couple that I bought at garage sales, and now people have given me a couple. In fact I kind of have too many! 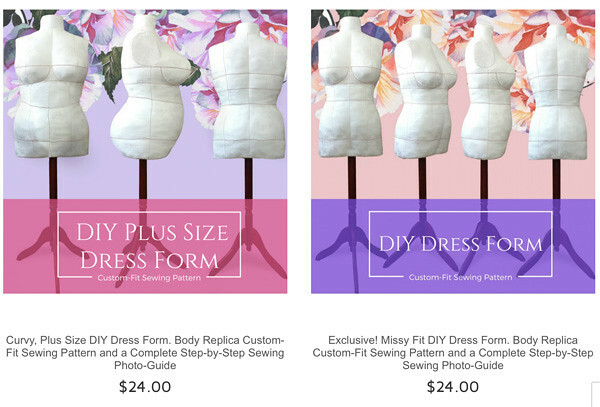 But last year Yuliya from Bootstrap Fashion Patterns contacted me and asked me if I would try out her new patterns for sewing a custom sized dress form. I was interested but to my slight embarrassment it has taken me up to now to get it completed. My verdict is that is amazing! 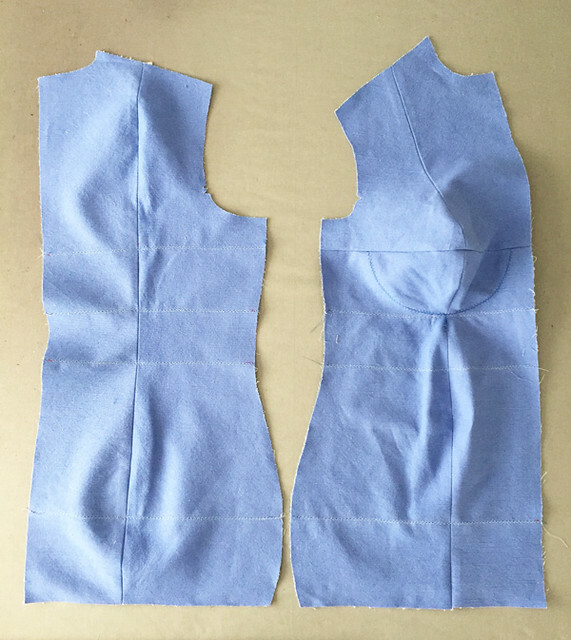 and like anything else in the sewing world, takes a bit of effort, might need some adjusting here or there but on the whole it is a great option if you want a dress form for your figure. Here's the image from their website and the link to this pattern page. Let's dive into the details. For starters I suggest you look at the Bootstrap Fashion page, and watch the video to see if it's something you would want to do. I have been planning to do this for months, ordered the pattern last year and finally printed it out and sewed it up. I didn't take all that many photos as I was constructing but a few so you can get the idea of the process. So I'm adding those photos here, with some details however I just wrote an extensive review on PatternReview.com so read that for more info. I will put the highlights and some of my advice here but definitely click over to that review as well. I made this using the measurements of someone I sew for regularly and it's pretty close to their shape. First thing - get a friend to help with the measurements. Some of them are quite specific and it's not really possible to do them on yourself. Here is the input screen, on each measurement there is a little question mark and red asterisk, if you click on that you get the little illustration to show how to measure which is really helpful. I printed out these screens so I could make notes of the measurements and then put them in the order when I had time to concentrate on it. The info about what fabric to use and the interfacing was invaluable, and I suggest following it. I followed their advice to create my paper pattern pieces, lay them out on fabric to determine just how much was needed. Saved some $ on the amount of fabric and interfacing which was less than I anticipated and then I could buy just what I needed. And also fuse just what was needed. Here are the main body pattern pieces. Not too difficult to assemble, sewing-wise. Here's a closer look at the pattern pieces. See all the different shape and size notches. Quite helpful and they matched up perfectly. I added 1/2" seam allowance - not sure why I chose that, probably 3/8" might be even easier to sew. This array above shows the pattern pieces for all the structure and internal support pieces, and the cardboard pieces. They look like kind of an odd shape, but how it goes together is that the body cavity is in half and supported down the center by two very firm pieces of fabric, so actually when you go to stuff it you are stuffing two the separate sides. 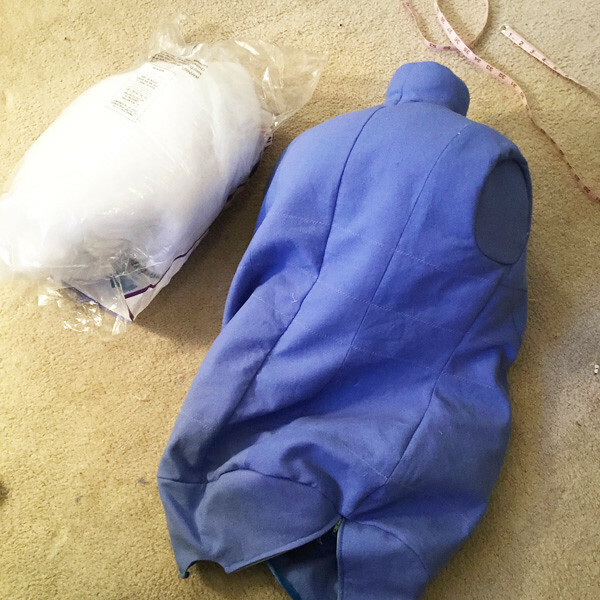 Here is one half of each front and back side by side so you can see how it looks prior to sewing it into a body shape. The horizontal lines are clever, at hip, waist, underbust and bust. I did them in a not too contrasty thread color - and skipped the one that goes across the bust cup, not sure why and I regret that now. I think the zig-zag stitching both gives you the horizontal lines, tames the seam allowances inside somewhat, and stabilizes the fabric in the horizontal direction so you don't over stuff. Here's a look at almost finished construction. 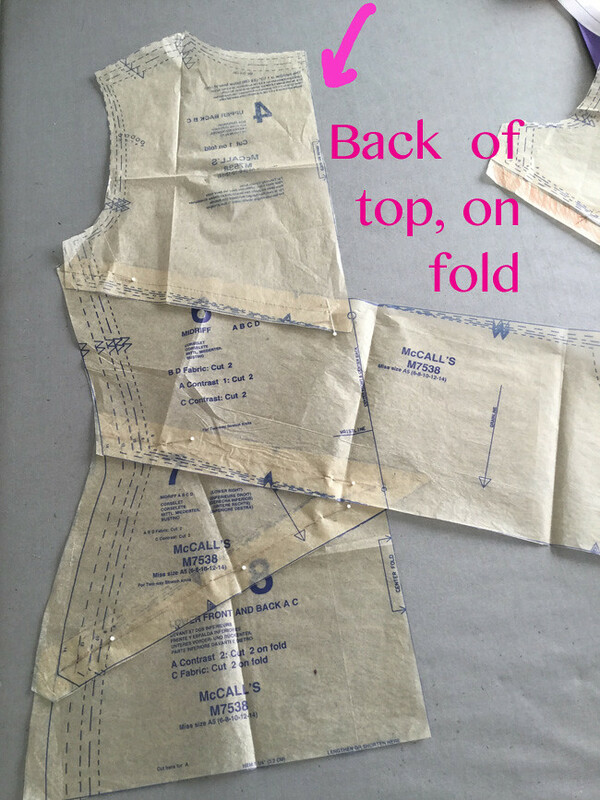 You create pockets at the armhole where a piece of cardboard is slipped in, to reinforce that area. Clever! The piece at the top with the rows of stitching is the internal vertical support. You can see it has a fabric tube in the center where the PVC pipe goes to hold the thing upright. This one is a bit sad looking - during the stuffing process it has the look of a deflated balloon when you are part of the way through. Read the details on my review to see what mistakes I made during these stages. But to sum up - you could do it on your own but having a helper is a plus. Stuff it all on one session. Measure as you go (which the video tells you to do) Don't over stuff. I put a few more photos on the review. You can see my stuffing is a tiny bit lumpy in places. I found that if you work with it, almost knead it a bit like you would with other things you stuff (pillows etc) it smooths out and gets the shape you want. So to summarize a few of my thoughts and observations. The instructions are really good. I suggest watching the video, reading through thoroughly and then assembling all your supplies before you start. The whole thing takes a good amount of time. 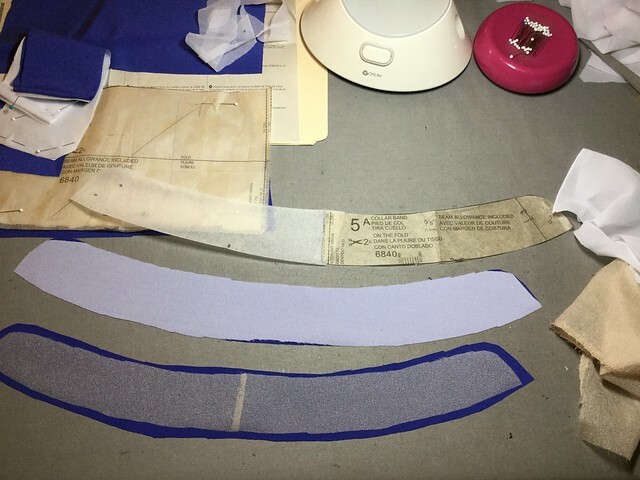 I am a really fast sewer (and at cutting out) but between printing the pattern pages, assembling, adding seam allowances, fusing interfacing, then cutting out, marking precisely, and then stitching up it is a good bit of time. Maybe 10-15 hours? This portion of the whole project can be done in lots of small increments as your time permits. Stuffing - have a LOT of the stuffing available. Buy more than you need and return if too much. Have someone help you - it gets a bit awkward to wrangle as it gets more stuffed. Do the stuffing in one session and close 'er up 😅. Measure the circumference at hip. 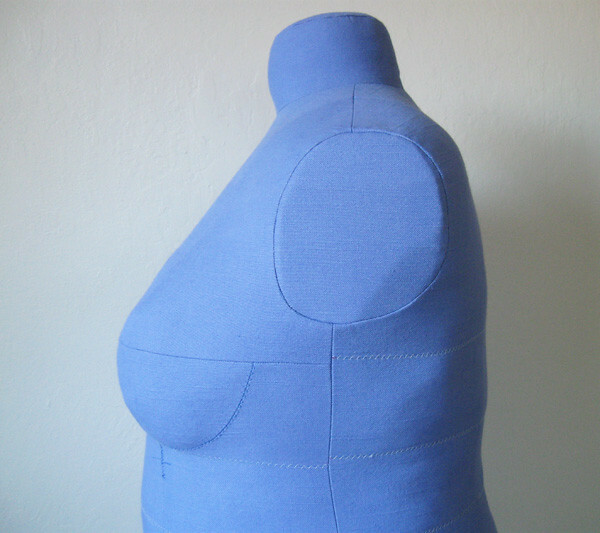 waist, bust etc which helps you get it stuffed correctly. Cost: the pattern is about $ 25. Supplies include the PVC pipe, glue, sponge, fabric, fusible interfacing... stuffing, Lots of Stuffing! I think I spent about $ 70. So the total is closing in on $ 100. I was able to put the form on the base of an old broken form. I read an idea about taking an old desk chair, removing the chair part and using the wheeled base - clever! Having wheels on a dress form is the best. I have one with wheels and it so handy. Measure carefully the base, pipe diameter etc. All that info in included in the instructions. 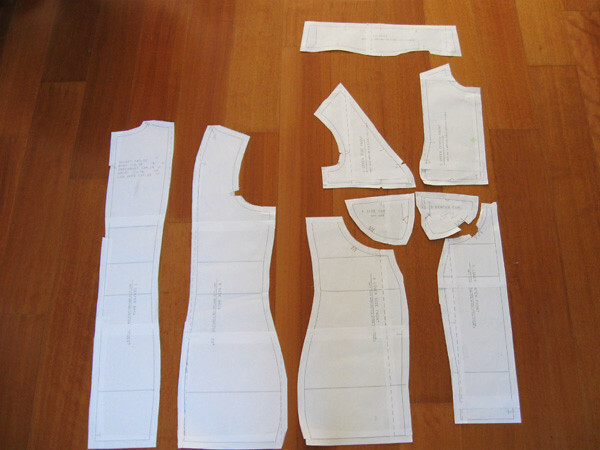 Fit: the pattern pieces did sew up to the correct measurements that I input. 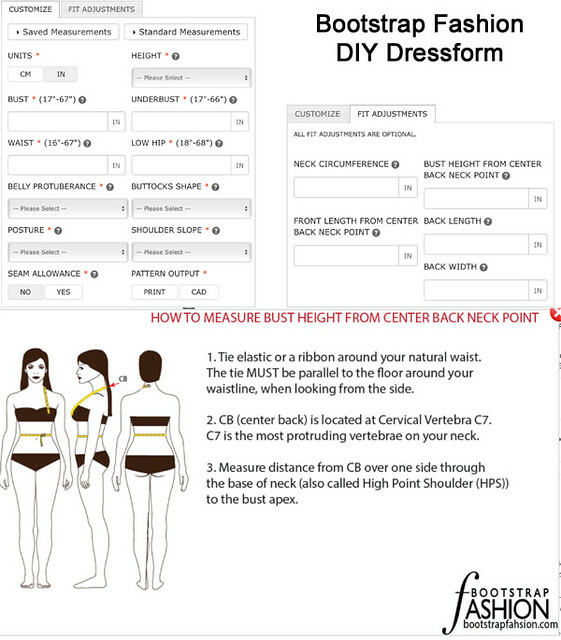 I especially like how the shoulders, neckline etc are the correct size, i.e. a body double. The shape of the bust is a bit generic but that was to be expected. I think I might input measurements that are slightly smaller than the actual body I was trying to do, and then have some wiggle room to pad out in places as needed. I hope this helps any of you who are interested in doing this. While it was a good amount of work it has a nice result. I'm generally not a person who does fitting on the dress form which a lot of people seem to think is the answer to everything (prefer to do by measuring the pattern) but having a dress form is nice, helps visualize things, get proportions right, is great for placing items on during construction. And if you can use it for fitting then that is a bonus. Up next - I am thinking spring although I have plenty of end of winter items still to blog. I posted a few peeks at my McCalls 7549 jacket so that might be next here. 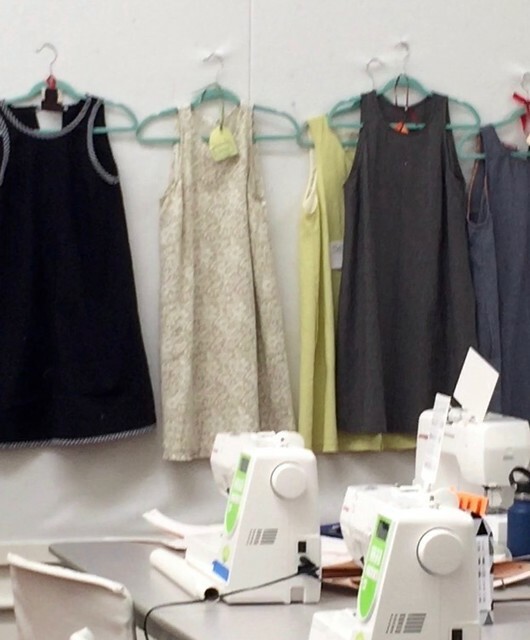 Classes I'm teaching in the upcoming months at Hello Stitch Studio in Berkeley are a mix of one's we offered before such as Garment Copy, Pattern Reading, and Knit T-shirt, plus some new ones which are Pencil Skirt class and a Pants fit clinic. 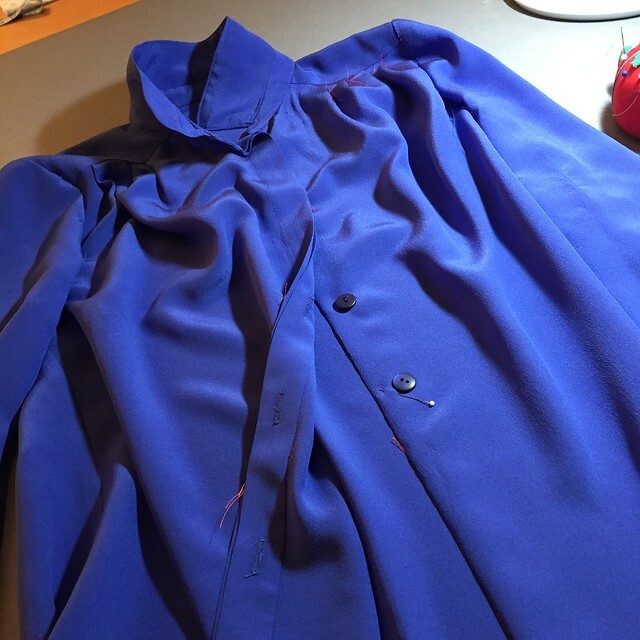 And next weekend's Jacket class has spots open so if you want to see me construct a jacket and see demos of all kinds of tips and tricks for fast tailoring please join us. Edit for Sat. April 7: thanks for all the info on the HE washing machine, I will try using a very small amount of detergent. And what? few comments on the custom dress form - that's what I thought would be the item of interest on this Random Threads 😄. 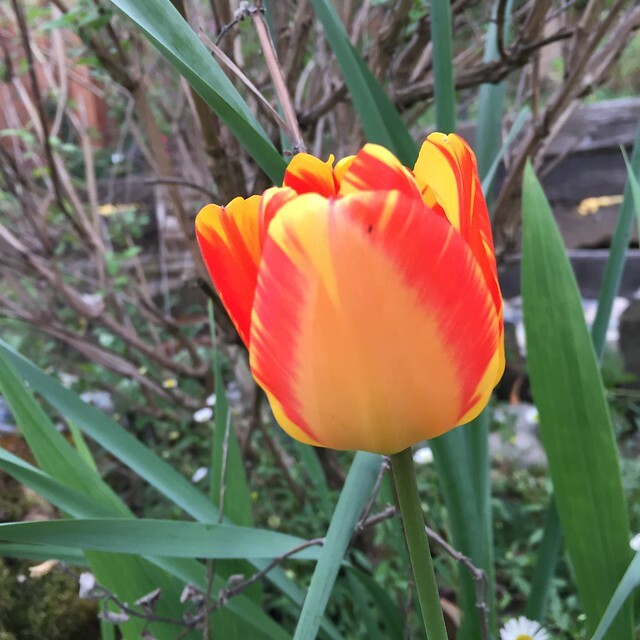 Today's garden photo - it's tulip time! !